Tired of spending money on chemically laced soaps? It is time to understand the power of homemade soaps. 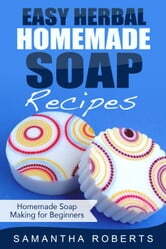 Here is a homemade soap recipe book to ensure you are able to make your own with ease. Herbal homemade soap recipes are great for beauty and health related issues. Samantha Roberts will teach you how to create soaps such as Honey & Dandelion Soap. Apple Cider Soap, and many more!